Blackburn Rovers vs. Chelsea : 5 November 2011. Another away game in Lancashire, another 400 miles in the car, another day of beers, coffees and junk food. Parky and I began the day with the Saturday morning ritual of a McBreakfast at Melksham. For a change, I decided to head north up on the Fosse Way – the old Roman Road – through Malmesbury and Cirencester and joined the northbound M5 after sweeping down from the lofty escarpment of The Cotswolds at Birdlip. The autumn colours were hitting their peak on the roadside oaks, elms and beeches, but there was an overcast grey sky overhead. As we drove north, the weather gradually improved, with more and more blue peeking through the grey clouds with each passing mile. We stopped at Strensham and Stafford Services; both places were full of Liverpool and Manchester United fans. There were also a substantial number of Swansea fans heading up to their game at Anfield. As we approached Keele Services, we passed a Chelsea coach and I quickly called Alan, who was travelling up with Gary. Yes, he was on the coach and he saw us wave as we changed lanes a few cars ahead of him. I half-expected Lord Parky to thrust his crutch out of the window, pointing it skywards. The Chelsea expeditionary force, some four thousand strong, was on its way north. We also passed a Chelsea coach from Saffron Walden. I ate up the miles and was making good time. We didn’t speak much about the game against Rovers, although other aspects of our fanaticism of Chelsea dominated the conversations. This would be my eleventh visit with Chelsea to Ewood Park. For the past four or five visits, I have always met up with other mates at the traditional away pub, The Fernhurst, but I fancied a change. Way back in 1995, Alan and I spent an enjoyable pre-match to the west of Ewood Park in a pub in a village called Tockholes. My friend Mark, a Rovers fan from nearby Darwen, had recommended this pub. His sister Linda lived in Tockholes, as she still does, and The Victoria was her local. Sixteen years on, I wanted to go back, but had decided on another of the pubs in the small village; The Rock. Mark had ‘phoned me at home on the Friday evening and had mentioned that Blackpool Tower could be spotted from The Rock’s beer garden on a clear day. So, a large part of my thoughts about the day in deepest Lancashire was devoted to thoughts about the pre-match pub. I was relishing it – the change in scene and maybe a few local delicacies to boot. Say what you like about my Chelsea obsession, but it certainly allows me to venture to parts of this green and pleasant land that I would otherwise have no reason to visit. At about 12.30pm, I exited the M65, past the hotel where I met up with Jamie (from Virginia, now residing in New York) for her first Chelsea game. That was almost three years ago to the day, how times passes; it was the day that it rained cats and dogs, the day we won 2-0, the day Anelka nabbed two. It was the day I had to stop on the way back for an hour because the road conditions were too treacherous. I ascended the narrow lanes which lead from the main Darwen to Blackburn road and found myself heading into Tockholes at about 12.45pm. The village is way up on a ridge of high moorland to the west of Ewood Park. I spotted The Rock pub in the distance, but away to my right was a magnificent view of Lancashire, heading towards the Fylde coast. And there, just visible in the distance was Blackpool Tower, some twenty miles away. Inside, the pub was very cosy, with a coal fire roaring just to the left of the bar. I ordered Parky a lager, but I fancied something more local to the area. I’m no beer aficionado, but I fancy the occasional change from lager. I decided on a pint of Thwaites Wainright ale. It was very tasty and a gorgeous amber colour. We began chatting to a friendly local couple, Rovers fans on the way to the game, before their faces disappeared behind massive piles of food on their respective plates. I spotted the man struggling to peer over a massive portion of cauliflower. Mark’s sister Linda then walked into the bar with her husband Ian and it was lovely to see familiar faces two hundred miles from home. I last saw them at Mark’s wedding in the summer, and they sat down next to Parky and I just as my food arrived; a plate of Bury black pudding, bacon, a poached egg and a small salad. Again, that hit the spot. We chatted about a few things, but talk was centred on the fortunes of our two teams. Linda and Ian were not going to renew their season tickets this season, but decided to go ahead and get them at the last minute. They have had season tickets for quite a few years. I’ve mentioned before how well Blackburn does to average around 22,000 attendances, since the town population is only 105,000 with Darwen (virtually a twin town to the south…there is hardly a break between the two) hitting 30,000. 22,000 out of only 135,000 is not a bad percentage at all in my book. We spoke about Chelsea’s little run of bad form, but also the demonstrations amongst the Rovers support against the current managerial incumbent Steve Kean. Both Ian and the other Rovers fan (coming into view after a mountain of chips had subsided) were both annoyed with both the appointment of Kean and also his utterances, claiming that Rovers were on the right track. Banners proclaiming anti-Kean sentiments had been banned from being taken into Ewood Park for the game, but we had heard rumours that the Rovers support had found an original way in which to vent their growing anxiety about their team’s poor form. The time had moved on to 2.15pm and we needed to be on our way. We bade our fond farewells to the locals and they wished us well. What a nice pub. As we said our goodbyes to Linda and Ian (“hope to see you here next season”), it dawned on me that we hadn’t spoken about the John Terry race row. I was thankful, to be honest. It was a subject that I was getting tired of having to talk about. I’m not saying that they might have taken an antagonistic approach to us. However, Mark’s name (and Linda’s maiden name) is Ferdinand. On the descent down into the valley bottom, I was able to appreciate a sweeping panorama of the town of Blackburn’s very “northern” setting; its terraced houses on the hillsides, its nearby hilltop farms, its industrial units, the barren moors to the north, Ewood Park. 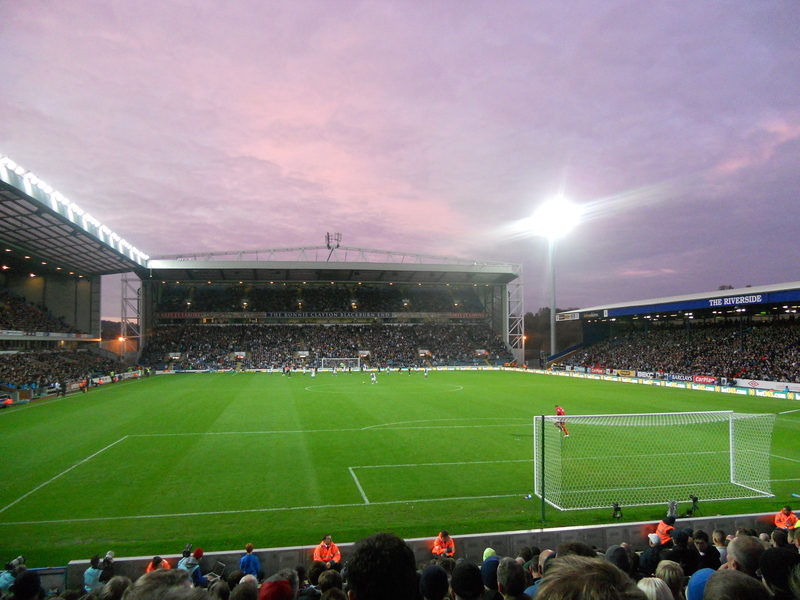 Ewood Park is located on the southern boundary of Blackburn, only half a mile from Darwen. There are terraced streets on three sides, with a stream and an open expanse of grass behind the single tier Riverside Stand. The other three stands were built between 1993 and 1995; the key investment period of Rovers’ very own sugar daddy, Jack Walker. It’s hard to believe it now, but back in that era, Rovers were a main player, buoyed by the millions which “Uncle Jack” ploughed into his local team. Because of my friendship with Mark, I’ve always had a soft spot for Rovers, even during the Mark Hughes years when we had a few tumultuous battles with them. I got to my seat with about five minutes to spare. I was keen to see how many we had brought. The ruling in general for away games is 10% of the total or 3,000, whichever is the smaller. In theory, as Ewood Park holds 27,000, we should be allowed 2,700. However, Blackburn (in addition to nearby Wigan, and Fulham), waive this ruling to allow more away fans to attend. I had heard that we had brought over 4,000 and that seemed about right to be honest. We were in the lower tier and I was certainly aware that there was a thousand or more Chelsea in the smaller upper tier. Alan had mentioned that there were “pay on the day” turnstiles, too. Before the game began, the two teams stood in the centre-circle as an announcement was made about a minute’s silence to honour the fallen. The minute’s silence would be followed by the last post, to be played by a lone soldier on a bugle. Unfortunately, it all didn’t go to plan. There didn’t seem to any silence and the bugler paused between sections of the music. Fans began polite applause, but then stopped as the second section began. Forgive the oldest of clichés, but the match turned out to be a game (like Rovers’ home shirt) of two halves. We lined up with a more physical defensive line of Brana, JT, Alex and Ashley. We hardly threatened Paul Robinson in the first-half. A nice move in the first few moments down the left resulted in a cross from Malouda just evading the lunge of Daniel Sturridge, now employed as a central striker in the absence of Drogba, Anelka and Torres. Soon after, we were exposed down our right – yet again – as Formica played in Yakubu. We all expected the net to bulge, but the shot flew wide. A brave challenge from Petr Cech obviously did enough to put Yakubu off, but we soon realised that he had been seriously hurt in the ensuing collision. We couldn’t really see what was going on and on occasions like this, the viewers at home are often in a better position than us match-goers. Thankfully, Cech was able to continue, albeit with a couple of nose plugs and a new shirt. He certainly gets in the wars. Chances were at a premium in the first-half, but Cech was in fine form and seemingly unhindered. The highlight for me was a gorgeously lofted ball from JT, running away from his defensive position, which was perfectly weighted with the right amount of “fade” which allowed it to drop into the path of Malouda. Despite seven extra minutes, we hardly created any clear chances in the half and there were certainly grumbles and moans at the break. Apart from a few “We are Chelsea – we’ll sing what we want” chants, there were no follow-up songs from Genk and certainly no racially motivated songs – aimed at Anton Ferdinand – and I for one was relieved. However, the noise levels weren’t great, to be honest. It seemed that our support was below par, too. At the break, we watched as Nando went through an intensive warm-up session. AVB was obviously going to change things and so we stood and hoped. He replaced a quiet Florent Malouda. Well, the second-half was much better. An early effort from Frank Lampard, which dipped viciously, was palmed over by Paul Robinson. Our early promise was soon rewarded when the ball broke to an advanced Ivanovic. He made an extra yard and delicately crossed a ball in with the outside of his right foot. A completely unmarked Lampard stooped low and guided the ball in just inside the far post. The ball was headed straight towards me and I knew that the despairing lunge from Robinson would not be good enough. At the other end, a high and hopeful punt caught Alex flat-footed and Yakuba broke away, but Petr Cech flung himself to he left to turn the ball away. A lightning break involving Ashley Cole ended up with a low ball being whipped across the six yard box, but a lunging Daniel Sturridge was unable to meet it. He appealed strongly for a penalty, but I wasn’t convinced. Rovers came back into the game and the away support grew quiet and tense. As the time passed, the cloudy sky overhead subtly changed colour as the sun set behind the stand to my left. Grey skies turned momentarily to an eerie shade of lavender. A double save from Petr Cech kept Rovers at bay. In the last five minutes of normal time, a Rovers corner was swung in with pace and Ivanovic jumped to clear, but got his timings all wrong. The ball flew off the top of his head and smacked against the bar. Torres had been pretty quiet, despite a few instances of nice control. In the closing minutes, the ball was pushed through and Torres broke. Rather than take the ball on and shoot himself, he played an awful ball to Sturridge. Studge managed to pull the ball back for Ashley and his lofted cross headed straight towards Torres on the far post. Here we go then. I’ve seen all of Torres’ other three Chelsea goals in the flesh and this would be the fourth. Torres, perhaps put off by the presence of Robinson, shot over from under the bar. I swore, just like thousands of Chelsea fans the world over. There was great relief as the referee blew up for the end of the game. We hadn’t played particularly well and Rovers perhaps deserved a point. The players came towards to the away section, but only four came all of the way up to the fences. Those players were Frank Lampard, Petr Cech, John Terry and Jon Obi Mikel; the four players, in my book, who had been the best players on the day. The spine had been strong. I looked on as JT took off his shirt and gave it to a fan. I met up with Parky as I walked out of the seats and said my goodbyes to Alan and Gary; a shame our next game is now two weeks away. We walked up the hill towards where the car was parked, but Parky was told to wait outside The Brown Cow pub. I walked on and collected my car. While he was waiting, a local had approached him, seen his crutches, and had bought him a lager. As I slowly made my way towards the M65, Parky slurped at his pint of Carling. It’s a friendly place is Blackburn. Birmingham was only half way home. Passing through the second city, we spotted hundreds of fireworks lighting up the night sky as we drove south. It was Bonfire Night and we were getting a free showing from the carriageway of the motorway. However, every few miles, on electronic signs above the motorway, there were grim reminders of an accident which had taken place in my home county of Somerset roughly twenty-four hours earlier. M5 – JUNCTION 24 & 25 CLOSED. Britain’s worst motorway accident in twenty years had resulted in at least seven deaths on a section of road near the Somerset capital of Taunton. On this night of all nights, I made sure I drove even more carefully than normal. After I dropped Parky off at 10pm, I listened in astonishment as a young man explained what had happened as car after car had slammed into a jack-knifed lorry. He had then gone back to assist in freeing injured passengers from the wrecked cars. He spoke plainly, without a hint of any embellishment of his incredible bravery and I was truly humbled. On a day when the brave soldiers who gave their all in order for our freedom to continue were honoured, it was quite fitting for me to be further reminded of what true heroes really are. This entry was posted in Season 2011-2012. and tagged 2011-2012, Pubs by Chris Axon. Bookmark the permalink.